A town meeting was called in the 1800's. Noah Tyson, Sr., Store owner, Police Juror, and Postmaster, to name their town. The frogs were hollering in a nearby pond. A man from Alabama jumped up and said, "Let's name it Frog Level." And so they did. On April 1879, M. C. Spearman was appointed Postmaster. 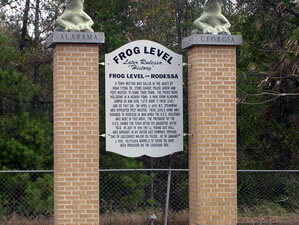 Frog Level's name was changed to Rodessa in 1898 when K. C. S Railroad was built in the area. The president of the K. C. S. Railroad named the town after his daughter, we are told. In July 1935 the I. L. Young Gas well was brought in by United Gas Company, opening one of Louisiana's major oil fields. As of January 1, 1973, 101,773,804 barrels of crude oil have been produced on the Louisiana side. Noah’s family had been in North Carolina since his 3g-grandfather Matthias moved there from Accomack Virginia around 1700 where his father John had settled after coming to the US from Europe in the mid 1600s. Matthias and his family entered North Carolina as early settlers of Bath County, in the area which is now Hyde County, and lived near Slade's Creek, a branch of the Pungo River. 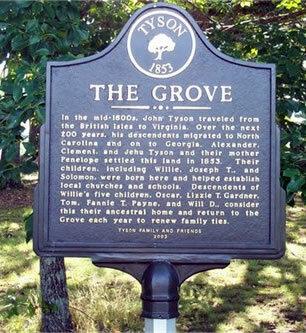 For the next 25 years the Tysons lived in the same area and son Edward were to remain and leave descendants there. Then, in the 1730s began a great migration of the family and a rise to prominence. 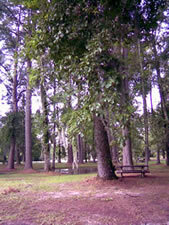 Sons Cornelius, Edmond, and Thomas Tyson, and John Hardee, husband of their sister Susannah, received large land grants in the area which was later (1760) to become Pitt County. Here they prospered and multiplied so that by 1762, the date of the oldest Pitt County tax list, 12 of the 492 households were headed by the grandsons of Matthias Tyson. The old homestead was on the North side of Tyson's creek and Little Contentnea Creek, ten miles west of Greenville. Many Tysons were Confederate War soldiers, they had large plantations that grew tobacco and owned many slaves, and there were some that had sworn allegiances to England. Shem Tyson - 1778/1825 / Lucretia Adams -1780/? Edmond Tyson - 1694/? / Mary ? Matthias Tyson - 1660/1710/Mary ? John TYSON is found in Northampton County, Virginia, as early as 1664. He is found in the tithables list (head tax lists) as early as 1664 as "Jan MATHIASON", in 1675 as "John MATHIASON", in 1676 as "John MATTISON" and in 1677 as "John TYSON". On March 27, 1679 "John TYSON and Susannika his wife and Matthias TYSON their son" bought 100 acres of land in Northampton County, Virginia from William ANDREWS. John TYSON appears to have died in Northampton County, Virginia during the first half of 1683, his Will being dated March 1, 1681, and probated August 28, 1683. In the Will he refers to his wife "Susanna TICE" and his "three children Matthias TICE and Anne TICE and Katherin TICE". John himself is referred to in his own Will as "John MATTICE" and "John MATTISON" and even signed his name as "Jan MATTISON". One must understand when reading the variations of the name "TYSON" that it underwent anglicization. It is the belief of some that John TYSON's real name was "John Matthias TYSON" because of the resemblance of the use of the name "Matt TYSON" for Matthias TYSON in a few documents and the names "MATTICE" and MATTISON". Source: Research of Bruce Tyson, and others: Because the name was anglicized after arrival back in English controlled Virginia, it is believed that the Tison family migrated from England to Holland for religious purposes, and then migrated to Virginia about the middle of the 1600's. Y-Chromosome DNA testing shows the Tyson's to be from the Haplogroup R1b sub-clade R1b1b2a2e (formerly R1b1c7) which shows possible ancient ancestry of North/West Ireland. 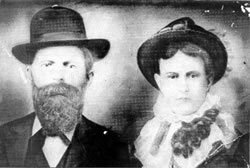 Earl & Huey Long: Caledonia Palestine Tyson, daughter of James E Tyson and Caroline Allbright of Georgia married Huey Pierce Long Sr in 1875 and were the parents of 11 children. Two of the sons were Huey Pierce Long Jr and Earl Kemp Long, both noted Louisiana politicians and attorneys. Located at 600 Tyson Road (1/2 mile north of Flat Rock Rd.) in Villa Rica, Georgia. Caledonia Palestine Tyson’s (the mother of Earl & Huey Long) father James E Tyson was born in Georgia in 1811. The Tyson family has two main branches in America, this North Carolina Branch that originated in Virginia, and another in Pennsylvania that was started by Reinier Tyson who came from Germany in the late 1600’s, he was a early founder of Germantown PA and is well documented in the local church records.